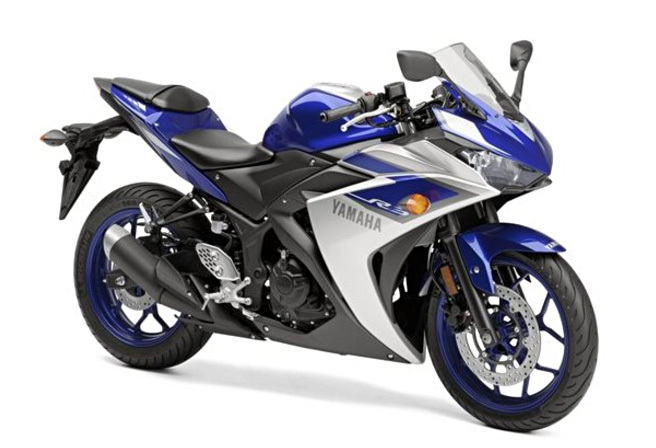 YZF-R3 Sports Model to Roll Out Globally from Jan. '15, High-performance, 320cc Motorbike Based on YZF-R25 Platform - News Releases | Yamaha Motor Co., Ltd.
IWATA, October 17, 2014 – Yamaha Motor Co., Ltd. (Tokyo: 7272) announced today that the YZF-R3 Sports Model motorcycle powered by a 320cc water-cooled, inline two-cylinder engine is scheduled for release globally, starting with North America in late January 2015 and then later in Europe, Asia and other regions. The YZF-R3, a model tailored for the global market, is based on the YZF-R25 model introduced in Indonesia in July. The YZF-R3 Sports Model boasts increased displacement and a lighter yet higher-performance chassis, a winning combination that immediately establishes the model as one of the most competitive entries in its class. The YZF-R3 is a high-end model designed to please diverse motorcyclists, from daily users to ardent road-racers. Its 320cc displacement, relatively large for ASEAN and other Asian countries, anticipates the surging popularity of sports models in such markets. In developed markets, where displacements of 600cc and over are considered mainstream, the YZF-R3 is expected to attract younger, less experienced riders looking for their first motorcycle. As an entry model, it is hoped to create new Yamaha fans who will step up to larger models someday. The YZF-R series features a wide lineup, beginning with the YZF-R1 (1000cc) super-sports flagship model, followed by the YZF-R6 (600cc), YZF-R25 (250cc), YZF-R15 (150cc), and YZF-R125 (125cc). Manufacturing will be carried out in Indonesia at PT. Yamaha Indonesia Motor Manufacturing.